This report is from Randy Lewis – World's #1 Track Chaser from San Clemente, California. He has seen over 1,660 tracks in 52 countries. His trip reports can be found at www.randylewis.org. What is a track chaser ? A trackchaser is someone who travels all over the world trying to see wheel to wheel auto racing at as many different racing tracks as possible. For more information on track chasing, check out http://www.autoracingrecords.com/tc/index.php. Here is his latest post, that included a review of Track Guide. Some time ago I purchased an “app” for my iPhone. That app is called “Track Guide”. As I recall I paid $4.99 for it. Most apps are free or cost 99 cents each. Therefore paying a premium price meant I thought I would really like the product. I do. DOWNLOAD TODAY. Track Guide is powered by the National Speedway Directory. Tim Frost owns this company. I’ve never met Tim but have talked to him on the phone. He seems like a nice guy. Since taking over the National Speedway Directory he has implemented several progressive new ideas. With the fading market share of printed material his new ideas may be just what the doctor ordered. Tim’s website is speedwaysonline.com. I don’t know that I am a perfect customer for the products that come from Tim’s shop. His National Speedway Directory (book) and Track Guide iPhone app list all of the major oval, road courses and drag strips in the U.S. and Canada. 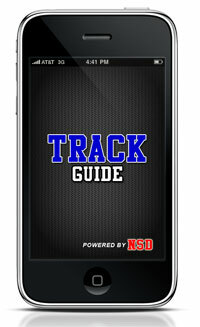 By the way Track Guide expects to have version 2.0 out soon for use with iPhone, Android and Blackberry platforms. Of course, trackchasers don’t count drag strips in the trackchasing hobby. Additionally, I have already seen more than 90% of the trackchasing countable tracks in the National Speedway Directory. This is not a criticism of these products. How many of their potential customers have seen more than 1,600 tracks? I used the National Speedway Directory religiously when I was “coming up” in trackchasing. Even at this stage of my trackchasing career there are several major pluses to the “Track Guide” iPhone app. I’ll tell you why I think this is such a wonderful product. 1. First, it works quickly. I can search tracks by state or type of track in a handful of seconds. 2. The app is updated periodically. That’s a real advantage. If a track changes phone numbers, race nights or whatever I can get the latest information updated by simply turning on the Track Guide app. 3. Once I find a track I want to learn more about Track Guide offers me three options. I can “map the track”, “call the track” or “visit their website”. By hitting a single button I can implement any of these choices. Mapping the track uses GPS capabilities. GPS has allowed me to see so many tracks so much easier than having to deal with paper maps. Calling the track with the press of a single button is so much easier to do while driving. Finally, visiting a track’s website tunes me onto scheduling info, rainout status and much much more. 4. A feature I find particularly useful for my travels lets me see what track is closest to wherever I am. As I mentioned I’ve already seen more than 90% of the ovals and road courses in the Track Guide database. Nevertheless, I can punch a button or two and find out which tracks might be within shouting distance. If I have time I can stop in a place I’ve already visited to see a race or two. Without this information I would not be reminded that a track I had seen in the past was so near to me. 5. Another major advantage is that you don’t need an internet connection for Track Guide to work. That’s a big plus. I can imagine that many racing fans might be at a track or in a rural area without access to either a Wi-Fi connection or a cellphone tower. 6. The $4.99 app charge is a one-time only fee. That’s a great value considering the constant updating that goes along with this app. Summary: I only wish I had both an iPhone and a Track Guide app ten years ago. It would have made life so much easier. If Track Guide sounds interesting to you, and I highly recommend it, then you can buy one directly from your iPhone. If you’re more of a “pen and paper” person the always useful National Speedway Directory might be your best bet. Check with Tim at speedwaysonline.com to get your copy. These products offer a lot for the money.